Wild oregano and cultivated oregano are fairly different. We will start with Origanum vulgare that is with cultivated oregano. Oregano grows on slopes and along the edges of forests, but it can grow in the rocky terrain in garden. It comes from the southern regions of Europe, growing up to a height of 60 cm and it has ovoid pointed leaves. Leaves are used as a spice and in medicinal purposes. It is propagated by dividing the roots or planting it in a permanent place in May at a distance of 20-30 cm. It blooms between July and September flowers are sometimes pale. It is harvested on a sunny day, around noon, with its stem. Use scissors and cut off the top half. Of the stem. It is dried on a thin layer on a strong draft or in shade. The drying leaves are removed from the stalks and are kept like that. It can be potted in autumn and used over the winter. The leaves of oregano contain tannins and bitter substances and essential oil containing 50% of thymol. For its effect oregano is reminiscent of marjoram and thyme, and is used in a similar way. It has a very pleasant and aromatic smell and its taste his somewhat sharp and bitter. Oregano is the favorite seasoning for pizzas and all kinds of dishes with tomato. Also it can also be used for grilling, salads and dishes with beans and peas. The oil of wild oregano is made from the special endemic species Origanum minutiflorum, which grows at an altitude of 1500-2000 meters, exclusively on the mountain Taurus in southwestern Turkey. This oregano oil is the most powerful natural antimicrobial agent in the world. Wild oregano proved effective in eliminating microorganisms such as Candida, E. coli, Staphylococcus, salmonella, helicobacter priori. Today oregano oil is used especially in the US and Canada as oregano drops because it is considered the best prevention of seasonal Influenza A H1N1 (swine flu) and colds. As the strongest herbal antiseptic, it helps in cases of health problems such as allergies, hay fever, actinomycosis, asbestosis, bronchitis, cough, bleeding disorders, cystic fibrosis, emphysema, nasal polyps, tuberculosis, pneumonia, sinus, throat and tonsils, but also to strengthen the immune system. Cultivated oregano contains a very small percentage of active ingredients. It is called carvacrol it has a strong antiseptic effect. Wild oregano is harvested in August and September, and the location on which it grows is very difficult to come to. Wild oregano is immediately dried on the mountain, placed in bags and lowered down the mountain where it is purchased and then transported around the world. 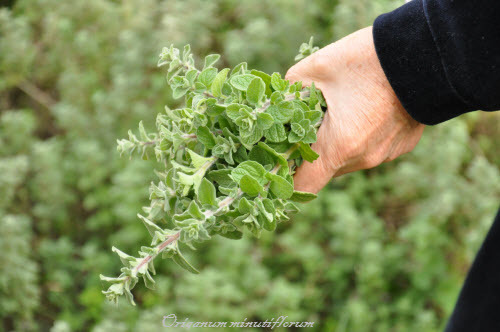 Wild oregano is one of the most powerful antioxidants in nature. ORAC score is a method of evaluating the antioxidant capacity of different foods and supplements, developed by scientists of Institutes of Health. According to the ORAC list, published by the US Department of Agriculture, wild oregano is fourth according to its antioxidant power, far ahead of chokeberry, cranberry, kiwi, lemon, orange and garlic. Put a tablespoon of rosemary, 1/2 a tablespoon of oregano. Cover the plate. Let it sit for a bit and then strain it. Also you can buy tea from wild oregano, which has for some time now accessible in Europe.